My entries are under my Mom’s name in the Rafflecoppter- Beth. 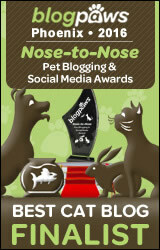 This would be pawsome to win, thank mew Sparkle! I am confident that Leonardo is intelligent enough to master this; he might even make the effort if the certainty of treats is involved. Looks like lots of fun for Kitties!!!!!!!! 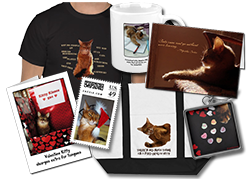 BTW, Sparkle, we love your new t-shirt at the Zazzle store! Big Henry, Monkey & Raggie Kokamo would love this! Thanks for giving someone a chance to win the extra. Tweeted as yahyahb and posted to rafflecopter using FB name, Angi Sheely. I would start wif teh yellow level. i fink i am up for it. pleasepleasepleaseplease pick me. that really looks like fun. and since teh lady keeps me in teh house a bunch these days, i needs some intellectual stimulations. fanks. Looks like you all had a great time with the Cat Amazing toy. I would love to be able to give this to my Sammy (also a Somali) and watch him have fun! Oooh, that does look like a lot of fun. Especially for our food addicted siblings! AUDREY! You are such a sweetheart to share! Maybe Santa Sparkle will be good to us & pick our names! We’ve been very, very good (don’t listen to our peep). Thanks Sparkle! Thank you for the chance to win! This looks like a fun place for the many paws here to dig around in! That looks like a fun place for my hamsters to hide, then I could try to tag them with my paw! That does look like fun- plus there’s an actual reward involved. Sign us up! Now, that looks like a LOT of fun, especially with the treats thrown in! Sign us up! That looks So FUN! I hope I WIN it!!! We did the rafflecoper thingy! Sign us up! Mowzers that is WAAAY cool! Sign us up! That is so cool Sparkle! We’re crossing our paws that we win! This looks like a great toy! We’d like to enter the contest. Thanks! That looks like a great toy. We would like to enter and if we were to win we would like to donate it to Marg’s Pets. Wow, that’s an awesome looking thingie!! What fun! Thunder loves when I hide treats in paper towel tubes–he would really love this! Our mom just recently got us one of these because she knows we like fishing for things with our pawsies 🙂 (plus we like our Peek-a-Prize toy). So far only Hollie has gotten to play with it but she says it’s great! We’ll stay out of the draw, but we think it’s great you are having the give-away, Sparkle! Good luck to everybuddy! Oh this looks fun! We would love one. TW was thinking about getting me a puzzle toy like this. They have a half case of something they drink in the hallway and it has holes in the top that I keep sticking my paws in, hoping to catch something good in there. TW bursts out laughing and says “No. No beer for kitty tonight.” How dare she laugh at me! OMC! I would totally love to have one. And EK loves any kind of puzzle solving. He’d go crazy for it. That looks like fun – my kitties are not motivated by food either or catnip or toys. My kitties are not motivated by much – except perhaps by pets – they looovvve to be petted. What a cool toy! We did the widget, please enter us!! What a great way to hunt treats … we would love to have one. That looks like a fun way to hunt for treats! That’s pawsome! We’d love one too! Oooh, the Farm cats would love that. Thank you for the chance to win! Oh Sparkle,you are so generous to give away one of these amazing looking toys! Wow- that looks like a lot of fun! My cats would enjoy it. Thanks for the opportunity! glad you guys like the toy! Awesome, Louie would love this.